FORT CARSON, Colo. - The Fort Carson Mounted Color Guard promoted its Army steeds during a ceremony conducted at Turkey Creek Ranch Dec. 11. Maj. Gen. David G. Perkins, the commanding general of the 4th Inf. Div. and Fort Carson, pinned rank on seven horses; Sgt. 1st Class Easy, Sgt. 1st Class Blitz, Sgt. 1st Class Murphy, Staff Sgt. Lefty, Cpl. Snoopy, Pfc. Gaucho and Pfc. Ahab. "This is a unique opportunity for the division," said Perkins. "Not every unit in the Army has the honor of having a Mounted Color Guard." 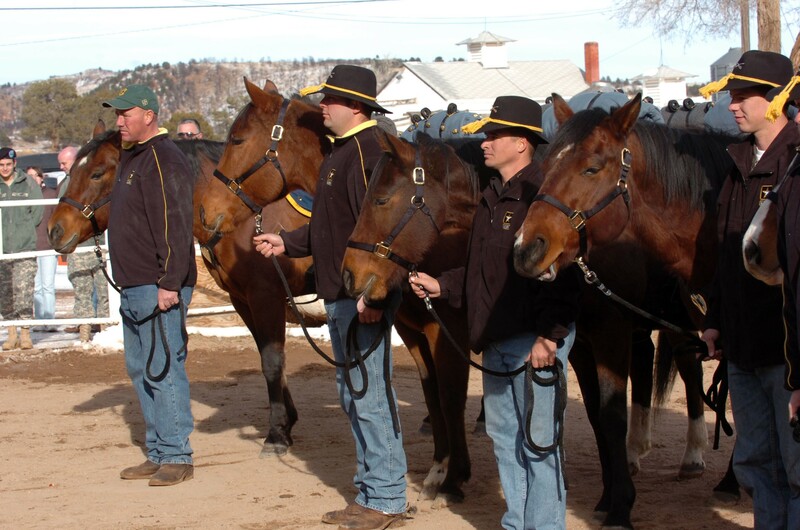 The Fort Carson Mounted Color Guard embodies the Army tradition of mounted Soldiers and their steeds and honors the service horses have provided the nation throughout history, said Perkins. "Horses have a long, distinguished history with the Army," said Perkins. "These animals are dependable, loyal, hardworking and great ambassadors for the Army, Fort Carson and the 4th Inf. Div." The traditional Army ceremony recognized the many contributions made by these service animals during their time in the Army, Fort Carson, and the Greater Colorado Springs communities, said Sgt. 1st Class Stephen Roy, Mounted Color Guard noncommissioned officer in charge, assigned to Company A, Division Special Troops Battalion, 4th Inf. Div. Sgt. Brent Miller, a fire support specialist assigned to Company A, DSTB, 4th Inf. Div., said that his experience with the Fort Carson Mounted Color Guard has been one of the most rewarding duties in his Army career. "These are really good horses we serve with and they are great representatives for the Army and the Colorado community," said Miller. "The Mounted Color Guard opens up a new aspect of the Army when we participate in community events like the Veterans Day Parade in Colorado Springs." Miller, who had no experience with horses before he joined the Mounted Color Guard in 2008, said that after his current assignment at Fort Carson he will miss working with his comrades and the horses. "I have enjoyed the job here and being with these animals has been a memorable experience that I will take with me wherever I go in my career," he said. According to the Fort Carson Web Site, http://www.carson.army.mil, the Mounted Color Guard was originally organized in 1963 as a 32-man horse platoon, participating in parades, rodeos and ceremonies across the country. The Horse Platoon was disbanded in 1978, leaving the eight-man Mounted Color Guard to represent Fort Carson and the Army throughout the Western United States. Adorned in 1874 uniforms of the 3rd Cavalry Regiment, the Fort Carson Mounted Color Guard carries the United States and Army Flags to approximately 200 community events and military ceremonies a year.